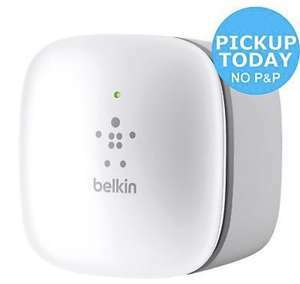 Not a bad price for this Belkin Wi-fi extender. Usual Argos free collection and guarantee. Seems to boost signal a bit for me - by no means revolutionary but stronger / more stable. I have one and it's ok - seems to extend the wifi range and maintains a connection, easy to setup etc. Think they're always around this price though - as above, I paid a similar price around a year ago, so not sure it's a deal exactly. Have to agree with previous comments, it improves the rage a bit but nothing drastic, picked up mine around eleven quid, open box from Amazon warehouse, not voted for this reason. I payed this price 3-4 months ago so not anything special in that respect. However well worth the money, holds the connection well and has given us a signal in the garden all through the summer months . Have two of these in the house, plug and play and bullet-proof for past two years....from my personal experience would highly recommend. Used one and it was awful. Constantly cut out or lost signal to the router. Had to reset it on nearly a daily basis until I gave up and bought another brand. Had one of those and it was crap. Would constantly disconnect and slow down the speeds to a crawl. I bought one of these while I was on holiday last year. The advert for the place where I was staying mentioned WiFi but in practice it was 'leakage' from next door and the signal was zero in half the house. I put one of these in a socket in a place with a signal and it filled the house with no problem. Extenders kill internet speeds. Between to use 2 routers. Good deal. Bought one of these yesterday as our existing Netgear N300 extender was getting a bit flaky. The Belkin is much better for the simple reason that it extends the existing network using the same SSID, rather than creating a new SSID that you have to switch back and forth to (this is how the Netgear worked).